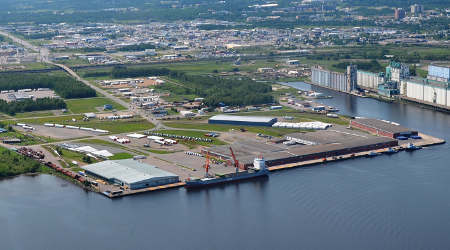 The Canadian government has committed CA$7.5 million for an infrastructure project at the Port of Thunder Bay. The project involves adding tracks and lay-down areas for cargo staging and trans-shipment to respond to increased demand, according to a press release issued by Transport Canada. Additionally, the project calls for construction of a 50,000-square-foot, multipurpose heated facility for terminal users. Once completed, the project will ease capacity constraints and bottlenecks, as well as provide more options to shippers. The government's investment in the Thunder Bay port project is another example of Canada's efforts to boost the economy by making improvements to trade and transportation corridors, said Transport Minister Marc Garneau. "We are supporting projects that will efficiently move commercial goods to market and people to their destinations, stimulate economic growth, create quality middle-class jobs, and ensure that Canada's transportation networks remain competitive and efficient," Garneau said.